Its a new year here in Sparta and there's no pretending its not winter. With temperatures barely climbing above freezing during the day, this might be the coldest overall week we've had in many years. Even though we plant and harvest year-round, growth is definitely slower this time of year. 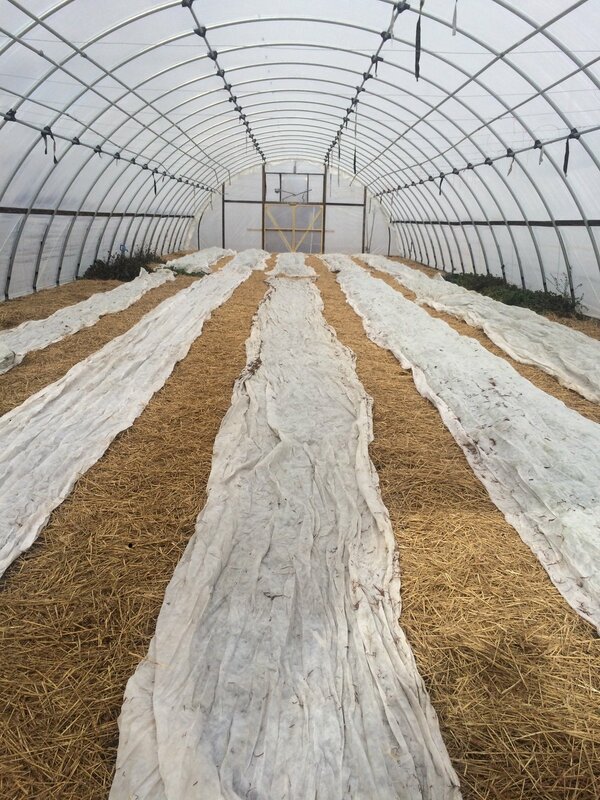 In the photo you can see we use a combination of row covers and hoop houses to protect from the cold. Each layer adds about 3-4 degrees of protection, so we might get a total of 7-8 degrees in the covered hoop house beds. But with lows in the teens, the plants still will still freeze, and a frozen plant doesn't grow. There are a few good things about cold weather though. It kills many weed and insect pests, and gives us an opportunity to focus on some indoor things like ordering seeds and supplies and going over finances. (And updating the website). 2018 has a few changes in store for the farm, with Josh and Jess moving on to start their own farm, and Jim returning to manage. We still plan to have the same high quality, organic produce as always, and look forward an exciting year of growth. Elm Street Gardens has always been concerned with growing good food as well as working on efforts to serve the community. New managers, Josh and Jessica, are doing a terrific job of growing that good food and plenty of it! This good food (which is certified organic) has been sold mainly in two Atlanta markets as well as a CSA or Farm Box Program offered locally. We have recently resolved to make this good food more readily available to our local community by offering on-farm sales on a regular basis to those local folks who are interested. Customers won’t have to sign up or pay in advance as they would if we were continuing with the Farm Box model. Anyone may come to the farm during our open hours and buy the fruit and produce of your choice. We plan to be open on Fridays and Tuesdays from 3 to 5pm. Be sure to check Elm Street Gardens Facebook page on Thursdays to see what we will have available on Fridays. Tuesday's market hours are planned to run June - October. Elm Street Gardens feels very much a part of the Hancock community and we hope to have this growing operation become more and more a part of that community. We hope this new sales model is successful for all and works for the community as well as Elm Street Gardens. Elm Street Gardens begins to glow with green in the spring. Elm Street Gardens managers, Josh and Jessica, are looking forward to welcoming local customers to the farm on Tuesdays and Friday from 3 to 5pm every week. Happy customers are loaded up with freshly harvested vegetables from Elm Street Gardens. Be thankful for the heat because it brings us the glories of summer. Of course, at the top of the list of those glories (well, at least MY list) are the wonderful tomatoes coming out of Elm Street Gardens. It is now officially the time of the year when you may enjoy sliced, dead ripe tomatoes with at least two meals a day. Rethinking my opening line above, about being thankful for the heat, we should note that too hot is not a good thing for tomatoes as well as people. So let’s hear it for a bit of moderation. Hopefully, the entire summer will not be the way it has started. Meanwhile, let us glory in our wonderful tomatoes! Elm Street Gardens tomatoes call to customers at the Morningside Farmers Market in Atlanta on Saturdays. There is no doubt that it is spring in Sparta here on Elm Street. Things are blooming, trees are full of new green leaves and pollen coats everything. Chickens are delighted to feast on some of their spring weed favorites, especially the appropriately named chickweed and hen-bit. And the vegetables are beginning to transition to spring and summer crops. The border of spirea behind the house never disappoints. This picture shows the early leaves just opening on many of the trees. Note that the pecan trees are the last to leaf out. White iris are generally the first of the iris to bloom. In this view of the garden below the house, you see kale plants responding to the warmth and sending out their flower shoots. I have been using these blossoms to add to salads. A shade covered oasis in the summer, this arbor in the garden is just beginning to green up. The aptly named snowball viburnum plants open their wonderful blossoms. Heirloom roses are favorites on Elm Street. The Elm Street tomboys seek a shady spot on a sunny day - but not before someone has captured another sign of spring: a young snake. Spring is, indeed, a magical time of the year. We are so fortunate to be so close to the changes and delights of the season here on Elm Street. You can get an idea of the size of these three big hoop houses here. You can also see how wet things have been lately! “To Everything There Is A Season” is not exactly an original line, but so true, especially in a garden. At this point in September however, we see both summer and fall crops co-mingling in the beds and that is something I certainly have occasion to enjoy. While I’m not yet tired of tomatoes, I surely am happy to see lettuces and other greens that prefer the cooler nights and days coming into their own. Last night we enjoyed fresh young turnip greens with our field peas, sliced tomatoes and grilled sweet peppers. The best of both worlds! While the favorites of both seasons have their brief moments of co-existing, it is clear the days are coming when heat loving summer vegetables will be finished. In the meantime, it is nice to see the bright green of the turnips and lettuces next to the struggling okra stalks. Looking out from the second floor of the house, this is a sight that greets me in the morning. I love seeing the bright light green of the young turnips in the farther bed. Swiss Chard never looked prettier than it did in the afternoon sunlight. And August's zinnias still bloom brightly in the afternoon sun too. And here is summer personified! This is the last of our day lilies still bravely blooming in September. Looks as if we have only one more bloom to go. Kale, kale, kale. Glorious kale has grown really fast and well in just a short time. 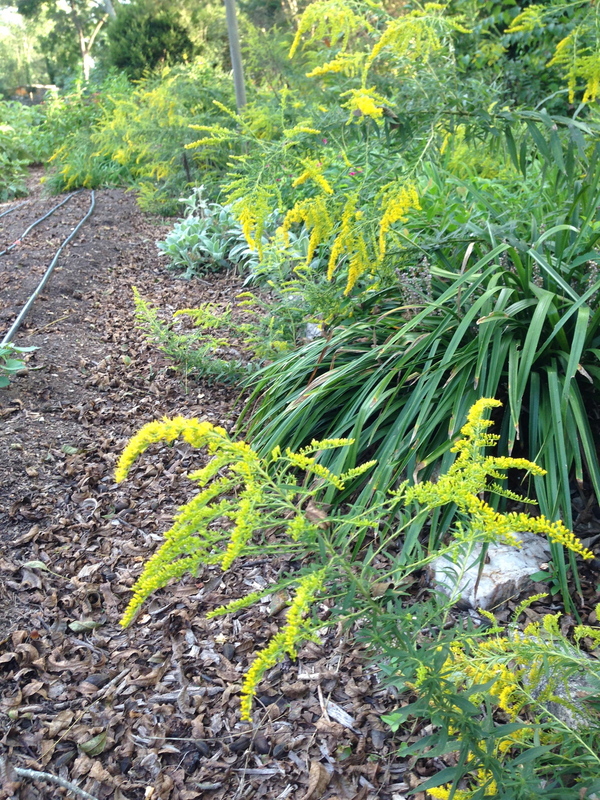 A true harbinger of fall: Goldenrod. I have read it is not really the allergen most people fear it to be and butterflies feast on it. 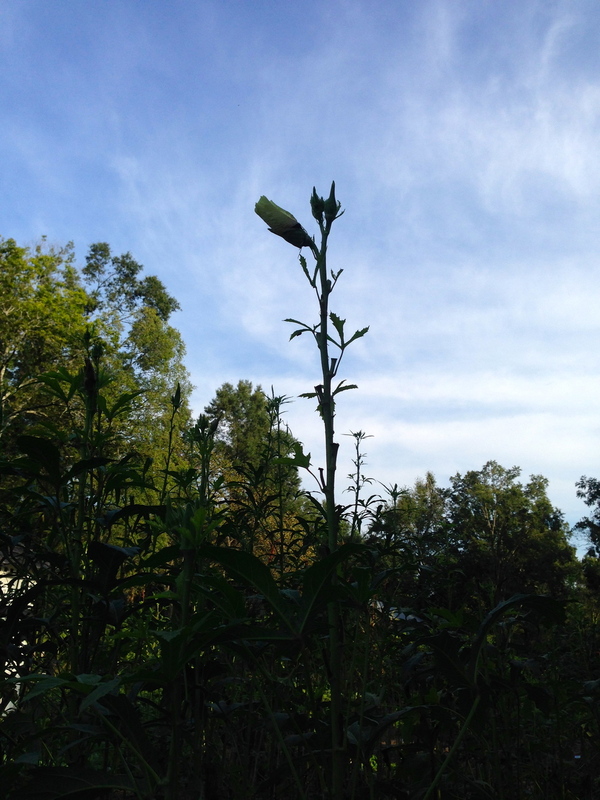 One of the sentinels of summer: The okra struggles on although the cooler nights slow it down.